Fibromyalgia syndrome (FMS) and Chronic Fatigue Syndrome (CFS) are rheumatic disorders characterized by chronic muscular pain, and fatigue and exhaustion. The lower back, neck, shoulders, back of the head, upper chest, and thighs can be affected. Pain can be described as burning, throbbing, shooting or stabbing which is worse in the morning. The most distinctive feature are “tender points” where the muscles are abnormally tender to touch. There are 18 possible tender points located on the human body. If an individual has 11 out of the 18 possible, typically without any other positive diagnostic findings (imaging, laboratory testing etc.) it is probable that the individual has fibromyalgia. The cause is unknown and the diagnosis is seldom easy or clear. More common in females and most often begin in young adulthood, symptoms come on gradually, slowly increasing in intensity. Triggers include a number of different factors as overexertion, stress, lack of exercise, anxiety, depression, lack of sleep, grief, trauma, extremes of temperature or humidity, or infectious illness. Symptoms are severe enough to interfere with normal daily activities and may even be disabling. These conditions present differently for patients; therefore, diagnosis and treatment varies per patient. Successful treatment can involve a cooperative effort with multiple providers and approaches to help the patient. Our doctors work other primary care physicians, a rheumatologists, or certified acupuncturists, and massage therapists. Adding a dietary and nutritional approach can also benefit the patient. 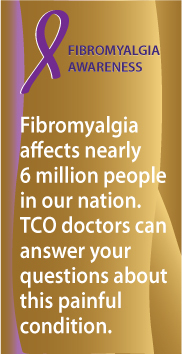 Call TCO to discuss your symptoms with our professional staff.